The new decorations for the family room are coming along rather slowly. As I mentioned in an earlier post, I was on a spending freeze. It's been lifted, but I have so many things I want to buy! I consider myself lucky that I have some kind of freedom to contemplate these things, but don't you just wish you could go out and buy whatever you wanted without worrying about the price? For instance, wouldn't it be much easier to just buy the darn candles you like instead of spending 15 minutes in the aisle worrying about getting the bigger candles because they're $1.00 more? Plus, they were 50% off! I think my husband's starting to get into my head. EEKS! 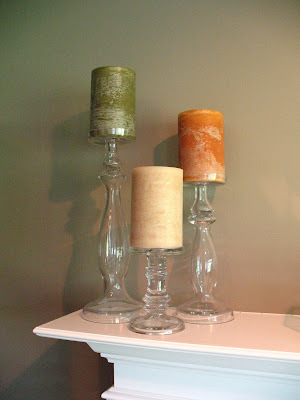 Any-who, I bought these candle sticks for the mantle. That's it. I love them, but that's it. 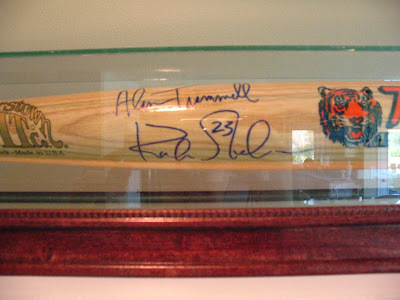 I can't imagine this would be of much interest to anyone who's not an obsessed Tigers fan like my husband, but it's personally signed by Alan Trammell and Kurt Gibson of the '84 World Series Team. Basically, if our house burns down, my husband will run in after this bat. And then he'll remember that he left me in the house and come back for me. Those candles are smokin'. ha ha Get it? That is a lovely bat. Perfect for any mantle really. (Rolling my eyes) My Dan has NO say whatsoever in decorating. I don't even ask him or tell him. The only agrees upon rule is no purple. For some reason he does not do purple. Men are just weird. oh my goodness!!!! i can 100% relate! my husband ran the torch for the atlanta olympics (1996?) for his teeny tiny town and of course his grandma had to buy him a replica torch to remember the day. and dontcha know he thinks its a real thing of beauty? yeah, i've got it hidden in my youngest daughter's closet behind my old clarinet and our board games. That is so funny! So typical. 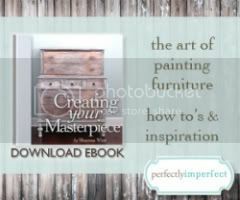 Luckily my husband actually has a great eye and even edits my own decorating sometimes. Sheesh, and I am supposed to be the professional. He makes me feel inadequate! LOL! 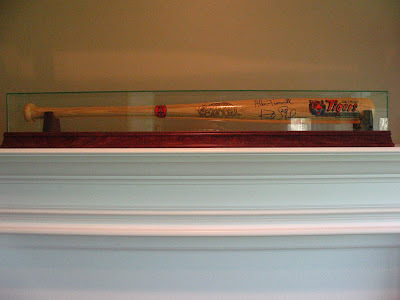 I can imagine how you must feel with a bat on your mantle. So unsettling. You are so not alone in this one. My poor hubby has only recently given up adding his "manly touch" to our decor. I certainly try and keep his preferences in mind and don't go all foo-foo on him though. I've promised him that he'll get a whole room in the new house (if we ever get in it) to fill with all the manly things he wants. I just clicked on to your blog from "The Nester" and I'll be back for sure. It seems like you have a lot to say that would interest me. Now, about that bat...you're a better wife than I would be, that thing would be removed very quickly to the study where The Husband has his desk but would never have a place on my mantle. I do love the candles and candlesticks though. Off to add you to my bookmarks now. I'm losing it, because I can't remember if I've posted a comment on your blog before today, or if I've just been blurking around.